"627-Glen Iris, Residence of Wm. 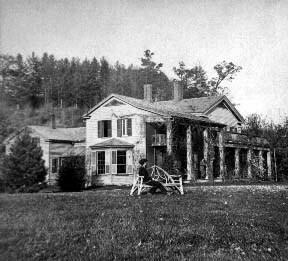 P. Letchworth, Esq, Portage, N.Y."
This early view of the Glen Iris was taken from the southern lawn. In the background you can see the Council Grounds bluff. Note that the balcony, still part of what is now called the "Cherry Suite" has already been built. The main part of the Glen Iris is only two stories - Mr. Letchworth would not add the third story until the 1880's.